Inflammation is a natural process that helps your body heal and defend itself from harm. Unfortunately, it can sometimes run wild and become more serious. Chronic inflammation can last for a long time and may lead to various health problems but also it is a way of the body protecting itself from infection, illness or injury. This is sometimes visible on the body by redness, swelling and pain but could also be internal without any noticeable symptoms which can lead to many diseases. One of the best measures a person can take to prevent or reduce inflammation is to try an anti-inflammatory diet. There are compounds in foods that help to switch off inflammation foods such as quercetin in red onions, curcumin in turmeric, olecanthal in olive oil, bromelain in pineapple, Vitamin C in berries, broccoli, sulphur in eggs, onions and garlic and not forgetting Omega-3 fats in oily fish. Therefore choosing a balanced diet that cuts out processed products and boosts your intake of whole, anti-inflammatory, antioxidant-rich foods will help you to feel healthier and reduce your risk of many diseases. 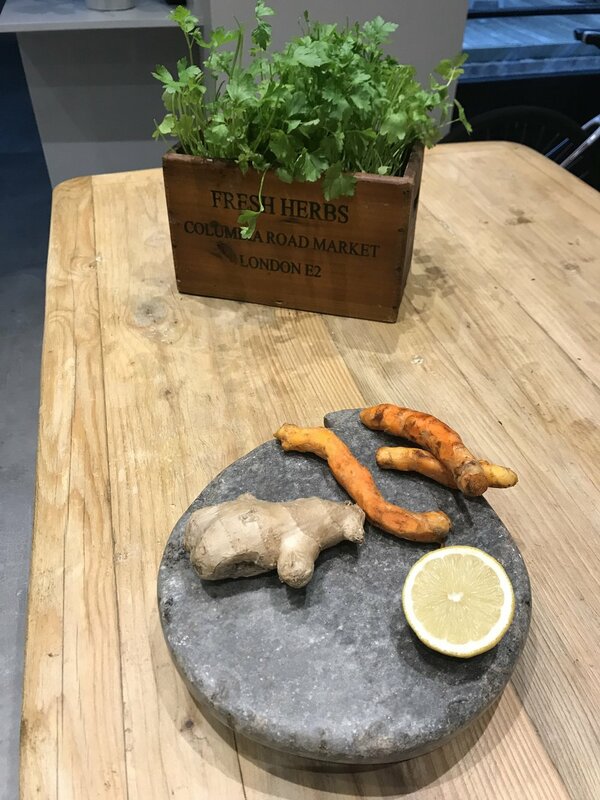 This evening cookery class is an introduction to preparing anti-inflammatory foods based on scientific knowledge of how they can help your body maintain optimum health into exciting and tasty recipes in a simplistic way, providing healthy cooking tips and allowing you to adapt your existing recipes at home. You will learn to cook a range of simple, healthy dishes using fresh and easily available ingredients. You will discover the medicinal benefits of carefully selected herbs and spices and how to incorporate them into dishes.